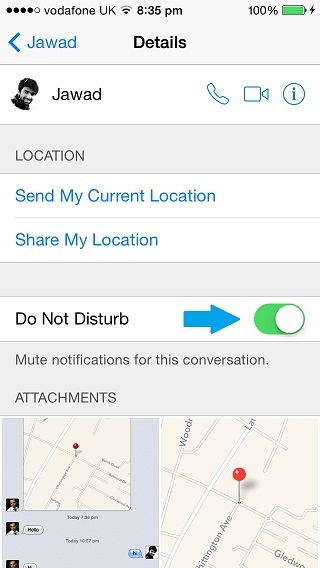 iOS 8 brings several new features to the stock Messages app. We recently told you about the app’s new ability to let users share their current location right from within a message thread. In this post we are going to tell you about another cool feature of this important stock app added in iOS 8, which enables users to mute any thread or a group chat using the ‘Do Not Disturb’ feature. This is the first time Do Not Disturb has been integrated in an app in this way as previously users could only activate this feature from Settings and it affected the whole system. Now however you can apply the Do Not Disturb to a single thread without affecting any other part of the OS. How this feature works is pretty simple, all you have to do is open the thread you want to mute. This can be a single person messages thread or a group chat page. Then you have to tap on the ‘Details’ button from the top and on the next page turn the ‘Do Not Disturb’ switch on. When you have turned the Do Not Disturb toggle on you won’t receive any disturbing notifications from this thread while you will receive all the messages sent to you by your friends. You can view these messages from the thread normally by opening it. Of course once you no longer want to prevent the thread from ‘disturbing you’ with notifications you can turn the ‘Do Not Disturb’ switch back off. This feature is very similar to WhatsApp’s ‘Mute’ feature and gives more control to the user. And if someone is too annoying to be just muted, there’s always an option to fully block a contact from sending you messages or calling you, however lets hope it doesn’t get to that point.